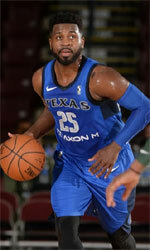 32-year old power forward James Mays (205-F/C-86) had an amazing evening in the last round for LG Sakers and receives a Interperformances Player of the Week award for round 41. He had a double-double of 33 points and 19 rebounds, while his team beat ET Land (#2, 35-18) 81-72. The game was between two of the league's top four teams. LG Sakers maintains the 3rd position in South Korean league. They would have been even better if they hadn't lost a few games earlier this season. LG Sakers will need more victories to improve their 30-23 record. Mays turned to be LG Sakers' top player in his first season with the team. Clemson University graduate has very impressive stats this year. 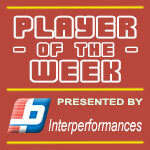 Mays is league's best scorer averaging so far 26.8ppg and leads league in rebounds with 14.7rpg. Mays is in league's top in and averages solid 53.8% FGP. Second best performed player last round was Shannon Shorter (193-G-89) of top-ranked Mobis Phoebus. He is American guard in his first season at Mobis Phoebus. In the last game Shorter recorded impressive triple-double of 25 points, 10 rebounds and 10 assists. Of course he led Mobis Phoebus to another comfortable win 100-85 over the lower-ranked DB Promy (#8, 23-30) being unquestionably team leader. Of course Mobis Phoebus still keep the league's top spot. His team has currently 42-11 record. Shorter is a newcomer at Mobis Phoebus and quickly became one of team's most reliable players. Third place about best performers goes to forward Eugene Phelps (198-F-90) of Samsung Th. (#10). Phelps showcased his all-around game by recording 24 points, twenty two rebounds (!!!) and six assists in the last round. Despite Phelps' great performance Samsung Th. 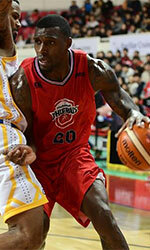 lost 88-89 to the higher-ranked Anyang KGC (#7, 24-29). But his team cannot count on just a single player as he also needs help of the other teammates. Samsung Th. can only dream about fighting for top spots in the league. They have extremely bad season and 11-42 record places them at the very bottom of the standings. Too bad for Phelps he does not play for a better team. But maybe if he did, his season stats would not be that high. Phelps has individually a great season in South Korea. After 37 games, he made it on the list of the league's leaders in points with 26.2ppg (2nd best) and rebounds with 13.5rpg (4th best). He also has 1.6bpg and FGP: 53.1%.